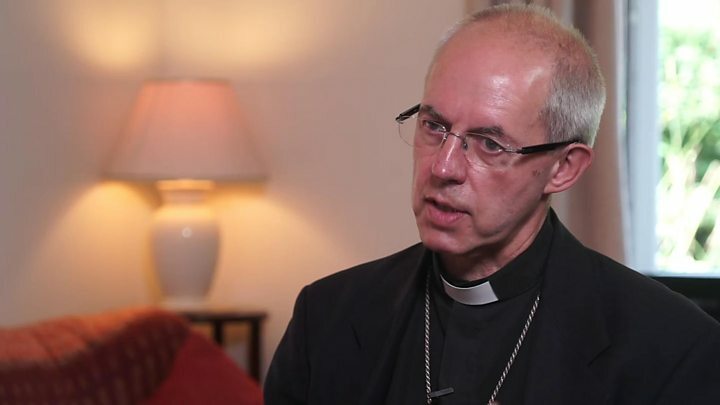 In an interview with the BBC to mark the launch of a major report by the Commission on Economic Justice, of which he is a leading member, Archbishop Justin Welby said the present economy was "unjust". He backed demands from the commission for a new regulator for technology firms, similar to those that oversee public utilities such as energy and water. The spiritual leader of the Church of England said a new regulator would be tasked with ensuring that technology giants such as Google and Facebook were using people's personal data in a way that was socially responsible. "They have enormous power and the use and handling of data has huge implications for people's security," he said. "But it also has huge implications for the flourishing of individuals and the prosperity and fairness of our society. "If you corner the market in data, you have probably more wealth advantages than if you corner the market in gold or oil. "Data is the real place where the money is, and we've always said that people with huge power should be regulated." Archbishop Welby also argued for an increase in the minimum wage to better reflect the cost of living and support struggling families and said that without action, "bitter resentment" would grow. The commission, set up by the left-leaning think tank, the Institute for Public Policy Research, said the present "living wage", as it is described by the government, should be increased by £1 an hour to £8.83 for those over 25. It said people on zero-hours contracts should be paid 20% more on top of that figure. It also called for higher levels of corporation tax on businesses, a "minimum tax rate" on multinationals such as technology firms to stem "tax avoidance" and the scrapping of inheritance tax - to be replaced by a "lifetime gift tax" on any gifted income above £125,000. The tax would be levied on individuals rather than estates. "People suffer from injustice in the economy," Archbishop Welby told me. "People suffer from the need to go to a food bank, even when you've got two adults both working. "People suffer from being caught in a debt trap, because they can't replace a basic bit of equipment they need like a new stove, a washing machine - let alone have luxuries. "I think one of the regrettable things in the last few years has been to call what we used to call the minimum wage a 'living wage'. "We need a living wage because that enables people to live with dignity, and the dignity of the human being is fundamental to our understanding of what a just economy is about." Lord Bob Kerslake, the former head of the civil service, is also a member. The commission was launched in 2016 after the vote to leave the European Union, which some believe was driven in part by the economic difficulties faced by many millions of people. Its report says that problems in the economy are fundamental and have been building for more than 40 years. Low levels of investment by businesses and the government in anything from a new piece of technology to new digital and transport links have meant that growth has suffered, it said. And low levels of wealth creation, called productivity, have left many millions of people struggling as wages fail to keep up with the increase in prices. "I start with the dignity of the human being which is what I learn from Jesus Christ - the dignity and value of each individual human being, whoever they are," the archbishop said, arguing that he was "non-political" and that his was not an attack on any particular government or party, as the problems had long-term roots. He said he had met many politicians who were trying to tackle ingrained problems and that there was much to be optimistic about, including high levels of employment. A government spokesman said: "Since 2010, we've supported more people into work, introduced the National Living Wage worth £7.83 per hour, doubled free childcare and helped workers keep more of the money they earn at the end of every month by cutting taxes for 31 million people by an average of £1,000." The spokesman added the government was spending £20bn more per year on the NHS and increasing pay for teachers, nurses and soldiers. Archbishop Welby said there were widespread problems. "For a lot of people, even if their income has gone up a bit, it's become a lot less secure. "You don't know from one week to the next what you'll be earning. "And so for people trying to budget, people trying to just save a bit so that, I don't know, once a month they could have fish and chips with their kids or go to the cinema or go down to the beach on a nice hot summer, they can't plan. "It comes back to justice and the common good." I asked the archbishop if he agreed with the commission that taxes needed to increase on technology firms and the wealthy. "What is clear is that tax should be a fundamental part of being a citizen, and that those who have the most should pay the most," he said. "And that no company, through being multinational, being global, can evade the responsibilities of paying its proper amount of tax, based on the revenues it earns in this country. "So yes, some people will need to pay more. "I'm not going to point at individuals, but certainly we see people and companies that seem not to pay what sounds like a reasonable amount of tax."